The atmospheric attenuation of microwaves in dry air with a precipitable water vapor level of 0.001 mm. The downward spikes in the graph corresponds to frequencies at which microwaves are absorbed more strongly, such as by oxygen molecules. Microwaves are widely used for point-to-point communications because their small wavelength allows conveniently-sized antennas to direct them in narrow beams, which can be pointed directly at the receiving antenna. This allows nearby microwave equipment to use the same frequencies without interfering with each other, as lower frequency radio waves do. Another advantage is that the high frequency of microwaves gives the microwave band a very large information-carrying capacity; the microwave band has a bandwidth 30 times that of all the rest of the radio spectrum below it. A disadvantage is that microwaves are limited to line of sight propagation; they cannot pass around hills or mountains as lower frequency radio waves can. The next higher part of the radio electromagnetic spectrum, where the frequencies are above 30 GHz and below 100 GHz, are called "millimeter waves" because their wavelengths are conveniently measured in millimeters, and their wavelengths range from 10 mm down to 3.0 mm (Higher frequency waves are smaller in wavelength). Radio waves in this band are usually strongly attenuated by the Earthly atmosphere and particles contained in it, especially during wet weather. Also, in a wide band of frequencies around 60 GHz, the radio waves are strongly attenuated by molecular oxygen in the atmosphere. The electronic technologies needed in the millimeter wave band are also much more difficult to utilize than those of the microwave band. Microwave radio relay is a technology widely used in the 1950s and 1960s for transmitting signals, such as long-distance telephone calls and television programs between two terrestrial points on a narrow beam of microwaves. In microwave radio relay, microwaves are transmitted on a line of sight path between relay stations using directional antennas, forming a fixed radio connection between the two points. The requirement of a line of sight limits the separation between stations to the visual horizon, about 30 to 50 miles. Before the widespread use of communications satellites, chains of microwave relay stations were used to transmit telecommunication signals over transcontinental distances. Beginning in the 1950s, networks of microwave relay links, such as the AT&T Long Lines system in the U.S., carried long distance telephone calls and television programs between cities. The first system, dubbed TD-2 and built by AT&T, connected New York and Boston in 1947 with a series of eight radio relay stations. These included long daisy-chained series of such links that traversed mountain ranges and spanned continents. Much of the transcontinental traffic is now carried by cheaper optical fibers and communication satellites, but microwave relay remains important for shorter distances. Because the radio waves travel in narrow beams confined to a line-of-sight path from one antenna to the other, they don't interfere with other microwave equipment, so nearby microwave links can use the same frequencies (see Frequency reuse). 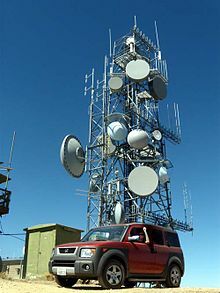 Antennas must be highly directional (high gain); these antennas are installed in elevated locations such as large radio towers in order to be able to transmit across long distances. Typical types of antenna used in radio relay link installations are parabolic antennas, dielectric lens, and horn-reflector antennas, which have a diameter of up to 4 meters. Highly directive antennas permit an economical use of the available frequency spectrum, despite long transmission distances. Because of the high frequencies used, a line-of-sight path between the stations is required. Additionally, in order to avoid attenuation of the beam, an area around the beam called the first Fresnel zone must be free from obstacles. Obstacles in the signal field cause unwanted attenuation. High mountain peak or ridge positions are often ideal. Production truck used for remote broadcasts by television news has a microwave dish on a retractible telescoping mast to transmit live video back to the studio. Obstacles, the curvature of the Earth, the geography of the area and reception issues arising from the use of nearby land (such as in manufacturing and forestry) are important issues to consider when planning radio links. In the planning process, it is essential that "path profiles" are produced, which provide information about the terrain and Fresnel zones affecting the transmission path. The presence of a water surface, such as a lake or river, along the path also must be taken into consideration since it can reflect the beam, and the direct and reflected beam can interfere at the receiving antenna, causing multipath fading. Multipath fades are usually deep only in a small spot and a narrow frequency band, so space and/or frequency diversity schemes can be applied to mitigate these effects. The effects of atmospheric stratification cause the radio path to bend downward in a typical situation so a major distance is possible as the earth equivalent curvature increases from 6370 km to about 8500 km (a 4/3 equivalent radius effect). Rare events of temperature, humidity and pressure profile versus height, may produce large deviations and distortion of the propagation and affect transmission quality. High-intensity rain and snow making rain fade must also be considered as an impairment factor, especially at frequencies above 10 GHz. All previous factors, collectively known as path loss, make it necessary to compute suitable power margins, in order to maintain the link operative for a high percentage of time, like the standard 99.99% or 99.999% used in 'carrier class' services of most telecommunication operators. Previous considerations represent typical problems characterizing terrestrial radio links using microwaves for the so-called backbone networks: hop lengths of few tens of kilometers (typically 10 to 60 km) were largely used until the 1990s. Frequency bands below 10 GHz, and above all, the information to be transmitted, were a stream containing a fixed capacity block. The target was to supply the requested availability for the whole block (Plesiochronous digital hierarchy, PDH, or Synchronous Digital Hierarchy, SDH). Fading and/or multipath affecting the link for short time period during the day had to be counteracted by the diversity architecture. During 1990s microwave radio links begun widely to be used for urban links in cellular network. Requirements regarding link distance changed to shorter hops (less than 10 km, typically 3 to 5 km), and frequency increased to bands between 11 and 43 GHz and more recently, up to 86 GHz (E-band). Furthermore, link planning deals more with intense rainfall and less with multipath, so diversity schemes became less used. Another big change that occurred during the last decade was an evolution toward packet radio transmission. Therefore, new countermeasures, such as adaptive modulation, have been adopted. The emitted power is regulated by norms (EIRP) both for cellular system and microwave. These microwave transmissions use emitted power typically from 30 mW to 0.3 W, radiated by the parabolic antenna on a beam wide round few degrees (1 to 3-4). The microwave channel arrangement is regulated by International Telecommunication Union (ITU-R) or local regulations (ETSI, FCC). In the last decade the dedicated spectrum for each microwave band reaches an extreme overcrowding, forcing efforts towards techniques for increasing the transmission capacity (frequency reuse, Polarization-division multiplexing, XPIC, MIMO). Antennas of 1931 experimental 1.7 GHz microwave relay link across the English Channel. The receiving antenna (background, right) was located behind the transmitting antenna to avoid interference. US Army Signal Corps portable microwave relay station, 1945. Microwave relay systems were first developed in World War II for secure military communication. The history of radio relay communication began in 1898 from the publication by Johann Mattausch in Austrian journal, Zeitschrift für Electrotechnik. But his proposal was primitive and not suitable for practical use. The first experiments with radio repeater stations to relay radio signals were done in 1899 by Emile Guarini-Foresio. However the low frequency and medium frequency radio waves used during the first 40 years of radio proved to be able to travel long distances by ground wave and skywave propagation. The need for radio relay did not really begin until the 1940s exploitation of microwaves, which traveled by line of sight and so were limited to a propagation distance of about 40 miles (64 km) by the visual horizon. In 1931 an Anglo-French consortium headed by Andre C. Clavier demonstrated an experimental microwave relay link across the English Channel using 10-foot (3 m) dishes. Telephony, telegraph, and facsimile data was transmitted over the bidirectional 1.7 GHz beams 40 miles (64 km) between Dover, UK, and Calais, France. The radiated power, produced by a miniature Barkhausen-Kurz tube located at the dish's focus, was one-half watt. A 1933 military microwave link between airports at St. Inglevert, France, and Lympne, UK, a distance of 56 km (35 miles), was followed in 1935 by a 300 MHz telecommunication link, the first commercial microwave relay system. The development of radar during World War II provided much of the microwave technology which made practical microwave communication links possible, particularly the klystron oscillator and techniques of designing parabolic antennas. Though not commonly known, the US military used both portable and fixed-station microwave communications in the European Theater during World War II. After the war telephone companies used this technology to build large microwave radio relay networks to carry long distance telephone calls. During the 1950s a unit of the US telephone carrier, AT&T Long Lines, built a transcontinental system of microwave relay links across the US that grew to carry the majority of US long distance telephone traffic, as well as television network signals. The main motivation in 1946 to use microwave radio instead of cable was that a large capacity could be installed quickly and at less cost. It was expected at that time that the annual operating costs for microwave radio would be greater than for cable. There were two main reasons that a large capacity had to be introduced suddenly: Pent up demand for long distance telephone service, because of the hiatus during the war years, and the new medium of television, which needed more bandwidth than radio. The prototype was called TDX and was tested with a connection between New York City and Murray Hill, the location of Bell Laboratories in 1946. The TDX system was set up between New York and Boston in 1947. The TDX was upgraded to the TD2 system, which used [the Morton tube, 416B and later 416C, manufactured by Western Electric] in the transmitters, and then later to TD3 that used solid state electronics. Military microwave relay systems continued to be used into the 1960s, when many of these systems were supplanted with tropospheric scatter or communication satellite systems. When the NATO military arm was formed, much of this existing equipment was transferred to communications groups. The typical communications systems used by NATO during that time period consisted of the technologies which had been developed for use by the telephone carrier entities in host countries. One example from the USA is the RCA CW-20A 1–2 GHz microwave relay system which utilized flexible UHF cable rather than the rigid waveguide required by higher frequency systems, making it ideal for tactical applications. The typical microwave relay installation or portable van had two radio systems (plus backup) connecting two line of sight sites. These radios would often carry 24 telephone channels frequency division multiplexed on the microwave carrier (i.e. Lenkurt 33C FDM). Any channel could be designated to carry up to 18 teletype communications instead. Similar systems from Germany and other member nations were also in use. 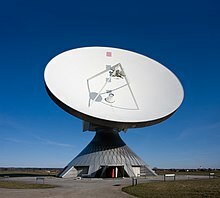 Long-distance microwave relay networks were built in many countries until the 1980s, when the technology lost its share of fixed operation to newer technologies such as fiber-optic cable and communication satellites, which offer a lower cost per bit. During the Cold War, the US intelligence agencies, such as the National Security Agency (NSA), were reportedly able to intercept Soviet microwave traffic using satellites such as Rhyolite. Much of the beam of a microwave link passes the receiving antenna and radiates toward the horizon, into space. By positioning a geosynchronous satellite in the path of the beam, the microwave beam can be received. At the turn of the century, microwave radio relay systems are being used increasingly in portable radio applications. The technology is particularly suited to this application because of lower operating costs, a more efficient infrastructure, and provision of direct hardware access to the portable radio operator. A microwave link is a communications system that uses a beam of radio waves in the microwave frequency range to transmit video, audio, or data between two locations, which can be from just a few feet or meters to several miles or kilometers apart. Microwave links are commonly used by television broadcasters to transmit programmes across a country, for instance, or from an outside broadcast back to a studio. Mobile units can be camera mounted, allowing cameras the freedom to move around without trailing cables. These are often seen on the touchlines of sports fields on Steadicam systems. Terrestrial microwave relay links are limited in distance to the visual horizon, a few tens of miles or kilometers depending on tower height. Tropospheric scatter ("troposcatter" or "scatter") was a technology developed in the 1950s to allow microwave communication links beyond the horizon, to a range of several hundred kilometers. The transmitter radiates a beam of microwaves into the sky, at a shallow angle above the horizon toward the receiver. As the beam passes through the troposphere a small fraction of the microwave energy is scattered back toward the ground by water vapor and dust in the air. A sensitive receiver beyond the horizon picks up this reflected signal. Signal clarity obtained by this method depends on the weather and other factors, and as a result a high level of technical difficulty is involved in the creation of a reliable over horizon radio relay link. Troposcatter links are therefore only used in special circumstances where satellites and other long distance communication channels cannot be relied on, such as in military communications. ^ a b Pond, Norman H (2008). The Tube Guys. Russ Cochran. p. 170. ISBN 9-780-9816-9230-2. ^ Umberto Casiraghi (May 21, 2010). "A vintage document: Reference Radio Link Telettra on the Red Sea, 360km and world record". Telettra. Retrieved 2012-10-02 – via Facebook. ^ a b Slyusar, Vadym. (2015). First Antennas for Relay Stations (PDF). International Conference on Antenna Theory and Techniques, 21–24 April 2015, Kharkiv, Ukraine. pp. 254–255. ^ Mattausch, J. (16 January 1898). "Telegraphie ohne Draht. Eine Studie" [Telegraph without wire. A study] (PDF). Zeitschrift für Elektrotechnik (in German). Elektrotechnischen Vereines in Wien. XVI (3): 35–36 – via www.slyusar.kiev.ua. ^ Free, E.E. (August 1931). "Searchlight radio with the new 7 inch waves" (PDF). Radio News. Vol. 8 no. 2. New York: Radio Science Publications. pp. 107–109. Retrieved March 24, 2015. ^ "Microwaves span the English Channel" (PDF). Short Wave Craft. Vol. 6 no. 5. New York: Popular Book Co. September 1935. pp. 262, 310. Retrieved March 24, 2015. ^ "Sugar Scoop Antennas Capture Microwaves". Popular Mechanics. February 1985. p. 87. ^ James Bamford (2008). The Shadow Factory. Doubleday. p. 176. ISBN 0-385-52132-4. ^ Kincaid, Cheryl-Annette (May 2007). Analyzing Microwave Spectra Collected by the Solar Radio Burst Locator (MSc). Denton, Texas: University of North Texas. Retrieved 2012-10-02 – via UNT Digital Library. Wikimedia Commons has media related to Microwave transmission. Bell System 1951 magazine ad for Microwave Radio-Relay systems. 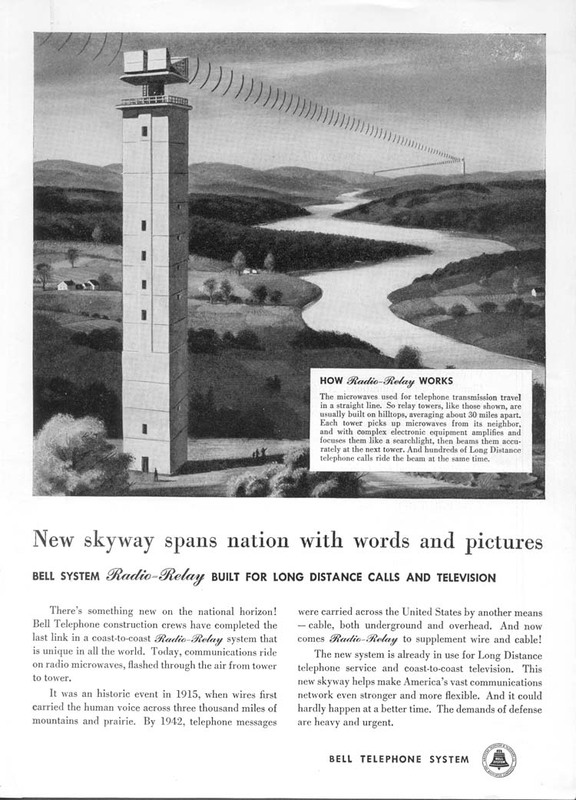 RCA vintage magazine ad for Microwave-Radio Relay equipment used for Western Union Telegraph Co.